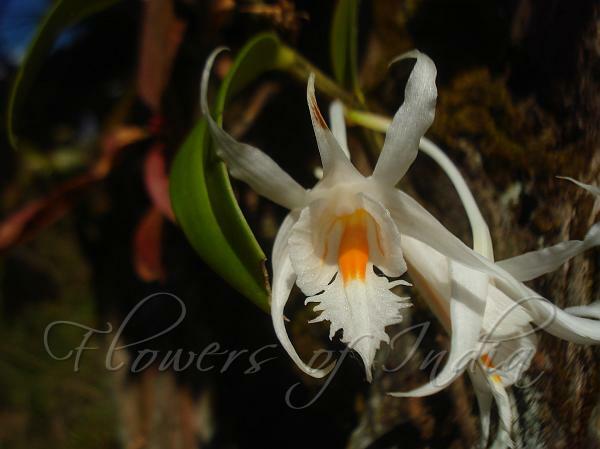 Long-Horned Dendrobium is a small sized orchid, growing on trees or rocks. This species has tufted, minutely sulcate, somewhat fractiflex, several noded, covered in black hairs stems. The plant carries 5-11, deciduous, linear-lanceshaped, obliquely pointed leaves. It blooms on very short, axillary racemes that arise from near the top of leafed canes with 1-3, fragrant, waxy, long-lasting flowers. Flowers are white, fragrant and 3.75 cm wide, pendulous, pointing downward, cylindric, lip with central part of disk orange. 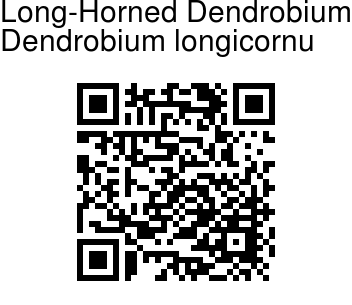 Long-Horned Dendrobium is found in the eastern Himalayas, Assam, Bangladesh, Nepal, Bhutan, Sikkim, Myanamar, southern China and Vietnam in humid, mossy, mixed and coniferous forests on mossy branches of old, dwarf, gnarled trees and primary montane forests at elevations of 1200-3000 m on mossy trees. Photographed in Baram, Uttarakhand & Shillong, Meghalaya.